Recovered from history, reprinted in limited quantities. The historic plates have been recovered and the vintage designs reprised by The United States Playing Card Company. 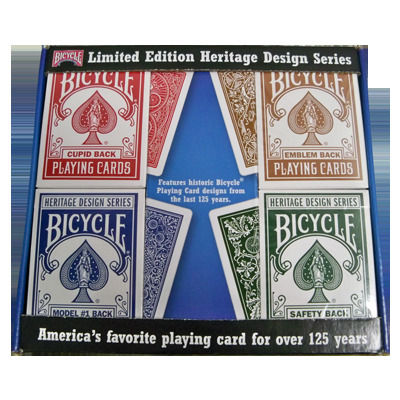 The Bicycle Heritage Design Series feature four historic playing card designs that have been out of print for over one hundred years. Now available in limited quantities. Classic and timeless design. A unique part of Bicycle's history. Acorn, Lotus, Nautic, and Automobile No. 2. This set of four is featured in a vintage banknote-style bag made from 100% natural and biodegradable jute twine. LOTUS BACK - Originally produced in 1891, this design has intricate architecture and floral elements that interweave across the back design. Printed in Blue. NAUTIC BACK - Originally produced in 1919, Nautics are one of our all time favorite playing card designs. Intricate, elegant, and extremely detailed. Printed in Green. ACORN BACK - Originally produced in 1891, Acorn Backs were one of the very first playing cards produced by The United States Playing Card Company. Printed in Brown. AUTOMOBILE No.2 BACK - Originally produced in 1913, this automotive design is a respectful nod to Henry Ford and the world's first cars. Printed in Red. Only 5,000 sets are available and once they're gone, they're gone! Here's your chance to own a part of Bicycle's history!